Effective highway history research involves consulting a variety of resources both online and in print. Many newspaper indexes are available that date back to the earliest highway projects in Minnesota and around the United States, as well as government records, books and reports. Many full-text resources are available on the Internet and through the MnDOT Library. This guide is a collection of relevant and useful resources our librarians have selected to assist you in your research. 1905 - The Legislature creates the State Highway Commission to build roads and bridges. 1920s - The Highway Commissioner won a state constitutional amendment allocating gas taxes solely to build and maintain roads & A constitutional amendment is adopted to create a system of 70 trunk highways. 1921 - The Legislature gives the Highway Department a mandate to acquire right of way; locate, construct, improve and maintain trunk highways; let necessary contracts; buy needed material and equipment; and expend necessary funds. 1944 - The Federal Aid Highway Act authorized funding for postwar programs to improve secondary rural and urban roads. 1945 - The Highway Department creates the State Aid Division to work with Minnesota's cities and counties. 1956 - Congress enacted laws that set up funding for the National System of Interstate and Defense Highways. Minnesota voters approved a constitutional amendment to distribute state road user funds. The percentages established were 62% state, 29% county and 9% municipal. 1969 - The Legislature established the Department of Public Safety. The Highway Patrol and Drivers License Bureau transfer from the Highway Department to Public Safety. 1976 - The Minnesota Department of Transportation was created and assumed the activities of the Departments of Aeronautics and Highways, plus transportation-related sections of the State Planning Agency and the Public Service Department. Today - In addition to roads and bridges, MnDOT develops and implements policies, plans and programs for aeronautics, freight and passenger carriers, ports and waterways, public transit, alternative transportation (bicycling), and railroads. 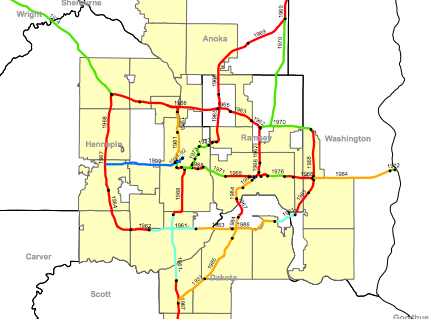 (A Brief History of MnDOT. Minnesota statewide historic railroads study final MPDF and project report, 2007 by Minnesota. Department of Transportation. The politics of building urban interstates : a contextual analysis of Twin Cities cases by Cavanaugh, Patricia. A primary source provides direct or firsthand evidence about an event, object, person, or work of art. Primary sources include historical and legal documents, eyewitness accounts, results of experiments, statistical data, pieces of creative writing, audio and video recordings, speeches, and art objects. Interviews, surveys, fieldwork, and Internet communications via email, blogs, listservs, and newsgroups are also primary sources. Secondary sources describe, discuss, interpret, analyze, evaluate, summarize or otherwise process primary sources. Examples of secondary source materials include newspaper articles, book or movie reviews, and scholarly journal content that discuss someone else's original research. Select the county you wish to search to find the route number that you want and select the control section . A control section is a numbering system MnDOT uses to keep track of segments of roads. Once you open a particular control section project log, you'll see a graphical representation of the history of that road segment and sub-segments including when it was built and when certain maintenance activities were performed. information you need to provide the highest quality transportation systems. Hours: M-F, 8:30 AM-4:30 PM.